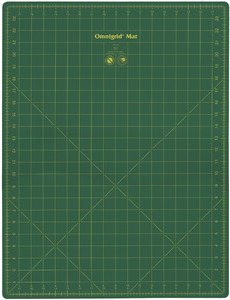 Mat made for double sided usage, the green side for light fabrics and the light gray for dark fabrics. The green side has a yellow grid that extends to the edge of the mat for both right and left handed users. This mat is designed to keep your rotary cutting blades sharp longer. Great to use with rotary cutters and Omnigrid rulers. Keep out of sunlight and store flat, do not roll up. 18 3/4"x 24 3/4"- with 1" grid, perfect for take-a-long, classrooms, beginners, quilting, crafts, memory books and more.